Pakistan’s premier entertainment network, HUM Network is proud to announce dates of the 11th Telenor Bridal Couture Week. 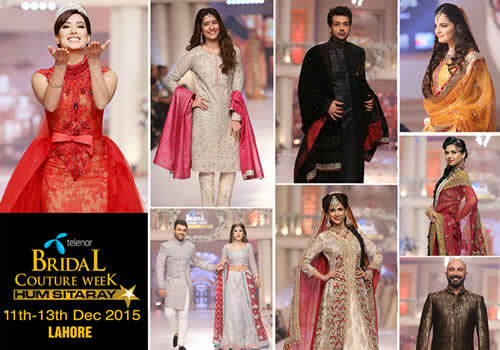 The country’s biggest bridal fashion extravaganza will dazzle Lahore from the 11th to the 13th of December 2015, while presenting the latest bridal trends by leading Pakistani and International fashion designers on the runway in its 11th installment. TBCW 2015 will feature 27 upcoming and top fashion designers from Pakistan along with some prominent international designers. Fashion sensation, HSY will continue his long standing relations with the platform by choreographing the show.